Yet again, we have another barbecue restaurant cooking eastern-style barbecue in Lexington country (in addition to Bill Spoon’s and Bubba’s). 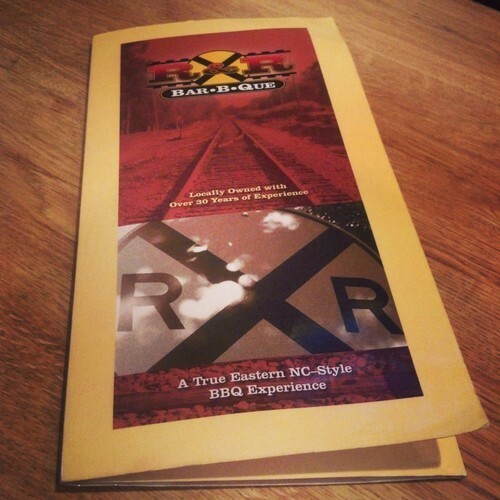 This time it’s R&R Bar-B-Que, a railroad themed barbecue restaurant in Concord. And boy, do they keep with the railroad theme. The wood paneled interior is filled with railroad memorabilia, photos, paintings, and even a couple of tracks with electric trains hooked to the ceiling (a la the old Ham’s in High Point). A little kitschy, but endearing enough. On this particular Friday, I arrived smack in the middle of the lunch rush and the restaurant was packed to the gills. It took a little bit for the waitress to finally come and take my order (though she was very nice and apologized for the wait) and to me, it looked like they could have stood to have another waitress or two working during lunch. It also took a little while to get the food once I placed my order, again likely due to the lunch rush. The plate finally arrived and though the pork was tender enough it lacked smoke and bark on the pork, likely due to the use of a gas or electric smoker. 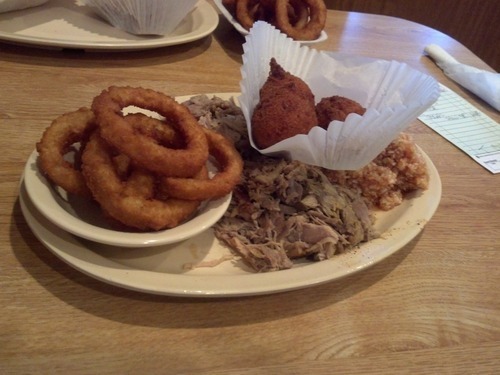 The hush puppies came in a coffee filter and were more savory than sweet, but were well cooked. Curiously, both white and red slaw are available on the menu, so of course I opted for the red slaw, which was finely chopped and surprisingly good for a so-called eastern-style restaurant. The onion rings were pretty standard. 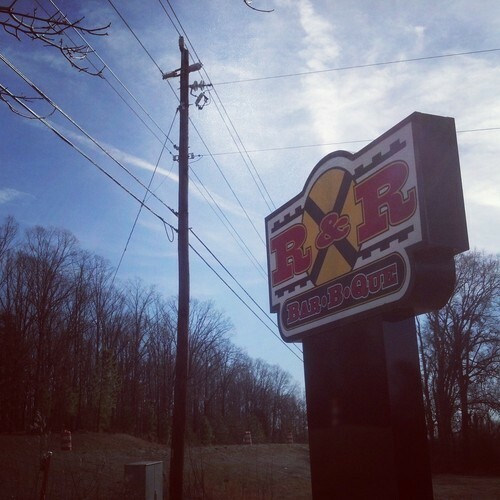 R&R Bar-B-Que has a sign off I-85 which I must have passed hundreds of times and noticed but paid little attention to it. I can’t recommend visiting during lunch unless you don’t have to get to anything pressing, as the meal took about an hour total from seating to paying the check. 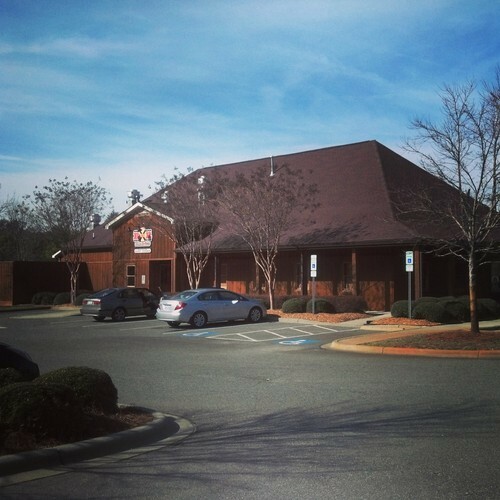 The staff was friendly, the food was decent, but if you are passing by the Poplar Tent Rd exit on I-85 looking for true barbecue feel free to keep on driving. 2.5 hogs? 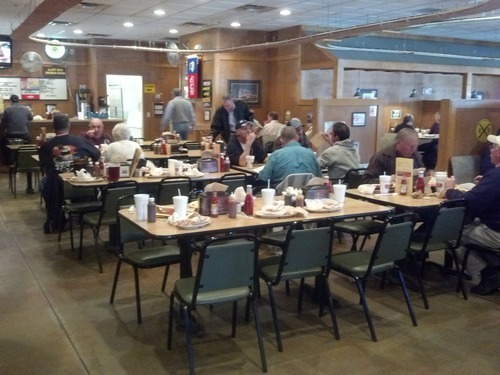 These guys deserve a 1 and even deserve to be docked a point for talking up their BBQ heritage. They use no smoke. Just like the German’s weren’t going to allow Budweiser to be marketed as beer we should have a law in NC that if you don’t use smoke in the cooking process you can’t call it BBQ. I like your enthusiasm, Mike! 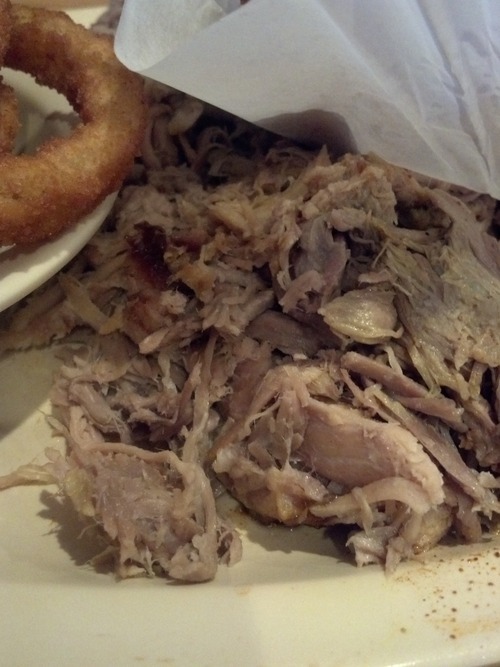 Unfortunately, smokeless “barbecue” is evermore becoming a common occurrence in NC but I agree with your point. This week on the blog we have the first of a two-part interview with pitmasters Matthew Barry and Michael Wagner (@michaelsanmartian) of Midwood Smokehouse (@midwoodsmokehouse). Link in profile.